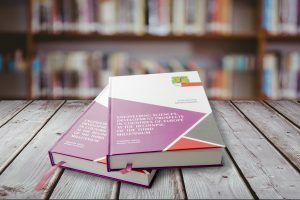 A monograph devoted to the topical issues of technical sciences was presented in the series of collective monographs, which were elaborated by the University of Economics in Stalowa Wola in association with the Center for Ukrainian and European Scientific Cooperation. The composite work was published by the European publishing house “Izdevnieciba “Baltija Publishing” (Riga, Latvia) that enable authors to present it as a paper published in the EU country. 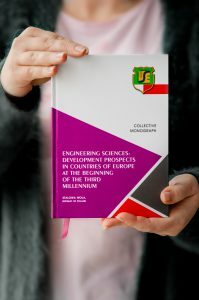 Due to the meticulous work of about 40 authors, among whom there were both well-known honoured scientists of Ukraine as well as young scientists, the collective monograph “Technical sciences: prospects for the development in the countries of Europe at the beginning of the third millennium” was prepared. Authors’ team involves: Kukhar V.V., Doctor of Technical Sciences, Professor, Head of the Department of Metal-Forming Process, SHEI “Pryazovskyi State Technical University”; Hrabovska O.V., Doctor of Technical Sciences, Professor at the Department of Sugar Technology and Water Preparation, National University of Food Technologies; Kukharets S.M., Doctor of Technical Sciences, Head of the Department of Mechanics and Engineering of Agroecosystems of the Faculty of Engineering and Power Engineering, Zhytomyr National Agroecological University; Frolova N.E., Doctor of Technical Sciences, Associate Professor, Professor at the Department of Technology of Restaurant and Ayurvedic Production, National University of Food Technologies; Podchashynskyi Yu.O., Doctor of Technical Sciences, Professor, Head of the Department of Metrology and Data-Measuring Equipment, Zhytomyr State Technological University; Kuzmin O.V., Candidate of Technical Sciences, Senior Lecturer at the Department of Restaurant and Ayurvedic Food Products, National University of Food Technologies; Marynin A.I., Candidate of Technical Sciences, Associate Professor, Head of Problem Scientific and Research Laboratory, National University of Food Technologies; Polishchuk M.M., Candidate of Technical Sciences, Associate Professor, Senior Lecturer at the Department of Engineering Cybernetics, National Technical University of Ukraine “Igor Sikorsky Kyiv Polytechnic Institute”; Borsukovska V.Yu., Senior Project Manager of LLC “Ukrsotsbank”; Borsukovskyi Yu.V., Candidate of Technical Sciences, Professor at the Department of Data and Cyber Security of the Faculty of Information Technology and Administration, Borys Grinchenko Kyiv University; Chemakina O.V., PhD in Architecture, Associate Professor, Director of Educational and Scientific Institute of Airports of the National Aviation University; Zhyvotovskyi R.M., Candidate of Technical Sciences, Head of Research Department – Deputy Head of the Research Department of the Central Research Institute of Arms and Military Equipment of the Armed Forces of Ukraine; Bieliakov R.O., Candidate of Technical Sciences, Lecturer at the Department of Hardware and Metrological Support of the Faculty of Information Technologies, Military Institute of Telecommunications and Information Technologies; Bilyk O.S., Candidate of Pedagogical Sciences, Associate Professor, Senior Lecturer at the Department of Foreign Languages, Lviv Polytechnic National University; Nechyporenko O.V., Candidate of Technical Sciences, Associate Professor, Senior Lecturer at the Department of Robotics and Specialized Computer Sciences, Cherkasy State Technological University; Kniaziev V.V., Candidate of Technical Sciences, Senior Research Scientist, Head of Research Department of Research and Designing Institute “Molniia” of the National Technical University “Kharkiv Polytechnic Institute”; Kurpe O.H., Candidate of Technical Sciences Chief Expert of LLC “Metinvest Holding”; Tsurkan V.V., Candidate of Technical Sciences, Senior Lecturer at the Department Cybersecurity and Application of Automated Information System and Technologies, Institute of Special Communication and Data Protection of the National Technical University of Ukraine «Igor Sikorsky Kyiv Polytechnic Institute»; Dorohyi Ya.Iu., Candidate of Technical Sciences, Associate Professor, Senior Lecturer at the Department of Automation and Control in Engineering System, National Technical University of Ukraine «Igor Sikorsky Kyiv Polytechnic Institute»; Hasii H.M., Candidate of Technical Sciences, Associate Professor, Senior Research Scientist, Poltava National Technical Yuri Kondratyuk University; Pastukh H.S., Candidate of Technical Sciences, Assistant Lecturer at the Department of Technology of Restaurant and Ayurvedic Production, National University of Food Technologies; Chychulina K.V., Candidate of Technical Sciences, Senior Lecturer at the Department of Company Economics and Human Resources, Poltava National Technical Yuri Kondratyuk University; Chychulin V.P, Candidate of Technical Sciences, Senior Lecturer at the Department of Metal, Wooden and Plastic Structures, Poltava National Technical Yuri Kondratyuk University; Ditrikh I.V., Candidate of Chemical Sciences, Senior Lecturer at the Department of Technology of Restaurant and Ayurvedic Production, National University of Food Technologies; Hudz S.A., Candidate of Technical Sciences, Senior Lecturer at the Department of Metal, Wooden and Plastic Structures, Poltava National Technical Yuri Kondratyuk University; Topchii O.A., Candidate of Technical Sciences, Senior Lecturer at the Department of Technologies of Meat and Meat Products, National University of Food Technologies; Dziuba N.A., Candidate of Technical Sciences, Associate Professor, Senior Lecturer at the Department of Technologies of Restaurant and Healthy Nutrition, Odessa National Academy of Food Technologies; Kotliar Ye.O., Candidate of Technical Sciences, Senior Lecturer at the Department of Technologies of Dairy, Fat and Oil Products and Cosmetics, Odessa National Academy of Food Technologies; Nesterko A.B., Candidate of Technical Sciences, Senior Instructor at the Department of Electric Power Engineering Automation, National Technical University of Ukraine «Igor Sikorsky Kyiv Polytechnic Institute»; Zemliakova O.V., Assistant Lecturer at the Department of Technologies of Restaurant and Healthy Nutrition, Odessa National Academy of Food Technologies; Kushpit U.V., Postgraduate Student at the Department of Foreign Languages of the Institute of Humanities and Social Sciences, Lviv Polytechnic National University; Saltan B.A., Master at the Department of Technology of Restaurant and Ayurvedic Production, National University of Food Technologies; Kuzmin A.O., Student of Educational and Scientific Institute of Airports of the National Aviation University, as well as other scientists who also contributed to the preparation of the scientific publication. We express our gratitude to all those who took part in the development of the collective paper and invite those who wish to join the preparation of the publication in the context of cooperation with headquarters in Nowy Sącz. The topic of the future scientific publication “GENERAL AND COMPLEX PROBLEMS OF TECHNICAL SCIENCES: EXPERIENCE OF EU COUNTRIES AND IMPLEMENTATION IN THE PRACTICE OF UKRAINE. Mode detailed information at a link.